U.S. money production in March picked up for a third straight month, running the quickest since October and faster than a year earlier, data from the agency responsible for printing American currency shows. A bit more than 560.3 million in $1s, $5s, $10s, $20s and $100s were produced last month for a combined value of just over $15 billion, according to the latest monthly figures from the Bureau of Engraving and Printing (BEP). In contrast, February levels registered at 521.6 million notes worth just over $14 billion. Presses were silent for $50s for the first time since November and there was a lack of $2s for a second month in a row after seeing them for five straight months. Compared to March 2015, the number of notes last month climbed by 5.7% from 529,920,000 while their combined value soared 69.6% from $8,870,400,000. Below are images of the BEP’s latest monthly production report. They show the type of banknotes manufactured at the agency’s two printing facilities. The BEP printed 3.52 million in star note spread between mostly $1s and some $20s. Star notes are replacements for misprinted or damaged notes and for certain serial numbers like 000 000 000. Star notes have serial numbers that end with a star “*” designation, and are also so indicated by quantities in the images above. 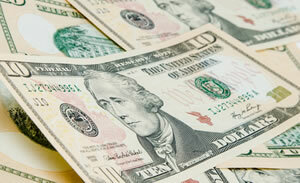 Money collectors usually find star notes more desirable since they can be harder to find. As a perspective, the BEP in FY 2015 delivered about 7 billion notes at an average cost of 10 cents each, and needed about 8.7 tons of ink each day to print them. More than 90% of the banknotes printed are for replacing those already in, or taken out of circulation. As an aside and according to data from the Federal Reserve, there was approximately $1.45 trillion in circulation as of April 6, 2016, of which $1.4 trillion was in Federal Reserve notes. The BEP operates on a fiscal year that begins on October 1 and ends on September 30. For FY 2016, the Fed ordered 7.6 billion banknotes. On another subject, the U.S. Mint on it’s website has sales figures as of April 24 of the 2016-W Winged Liberty Head dime Uncirculated regular business strike gold coins as at 122,510 sold. That means there was not a sellout of this coin. Have you been able to verify if this is a correct current figure? When does the Mint plan on offering the 2,490 coins that did not sell? Hope you can get an answer from Michael White or Tom Jurkowsky or someone at the Mint. Thanks! I missed not seeing a daily precious metals report for yesterday April 26 here. The facility in Texas is printing 2009 bills still for the $100 dollar bill??? Tell Janet yellen hi for me!!! It’s going to be the greatest show on earth!!!!! If you attempt “Grand Theft” from a Federal Reserve Bank, I guarantee you will get to meet Fed Chairwoman Janet Yellen in person – in Federal court! ! Lol.